Get a soft, naturally luminous effect from your highlighter with this year’s limited edition Holiday Brush. Designed to seamlessly disperse product over the skin with sheer, soft-focus payoff, this powder brush helps you achieve a subtle, your-glow-but-better look in a single stroke. Glide the brush along the cheekbone or any plane of the face in a straight line. 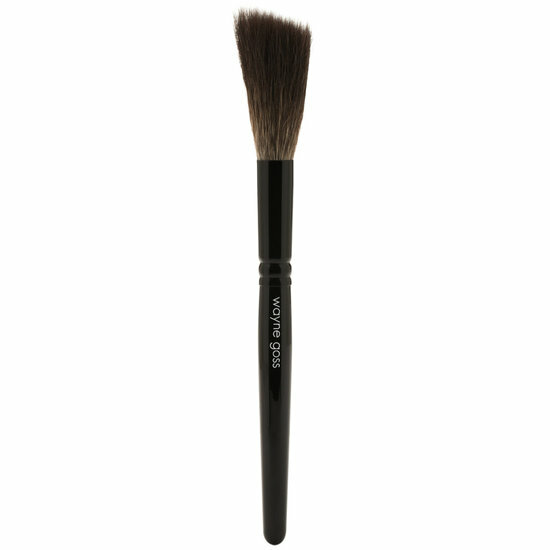 The Holiday Brush applies and blends powder as it goes, so no circular buffing is necessary. To clean your brush in between makeup applications, gently wipe it on a paper towel. Wash your brush occasionally with warm water and a gentle brush cleanser, like Clean Apothecary Brush Shampoo. Avoid getting any water into the ferrule. Dry your brush with a Medium Brush Guard to maintain the shape of the bristles. The softest WG brush out there! I own quite a few of Wayne's brushes (the anniversary set, 3 airbrushes, etc) and this is by far the softest brush he has ever made! I know that a lot of people will compare a brush's softness to say puppy fur, but this is even softer than that. And it is because of that softness is why it works so very well. The brush hairs are at that odd angle (that I've not seen from another brush) combined with the quality of the hair makes picking up and laying down highlighter powder, brush, bronzer a absolute breeze. 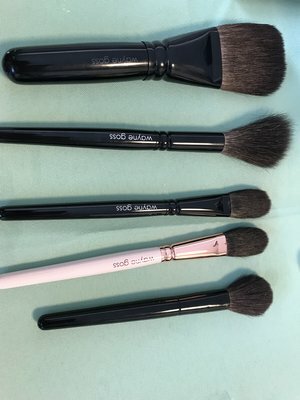 This brush is perfect if you're too heavy handed, or you've wanted to try out different colors/types of makeup, but are afraid of what the outcome may be. This brush lets you build up product very gently so it doesn't go from "this is lovely" to "OMG what did I do?!?" in 2 seconds flat. This brush is probably not for those that want to be seen from the space station with their highlight (no judgement whatsoever - makeup is fun!). But for those who may want to try to contour, may want to wear highlight during the day and it not be so blinding, or those of us with a heavy hand, this brush is worth every single cent. With proper care this brush should last for years, and I really hope that it does. As someone with arthritis in my hands and wrists I fall into the heavy handed category quite a few times a week. This brush solves my problem, and does so with ease. Thank you so very much Wayne for this beautiful brush. It really is a much needed piece in my collection. This brush is as Wayne describes on his youtube channel, very soft and for a soft diffusing application. The bristles are long, fanned out and very soft, so don't expect application to pack a punch. i love wayne goss brushes, have almost the entire collection except the eye brushes since i dont use eyeshadows. every brush has been multi-functional and if you watch his intro videos, he wants us to use them for a variety of purposes as well. this holiday brush however, soft as air can be, is not as functional. i know that he marketed it as a highlighter brush, to leave behind the subtlest hint of glow to the cheeks. well. the bristles are long and they spread out quite a bit after wash and during use. i felt i couldn't control the placement of highlighter. i then used it for all-over powder (too soft to pick up much product, had to go over many times) and blush (ooookay, again too wide area space to control placement). this is not a diss of this brush. it is beautiful and soft and well-made, no complaints there. i just don't really know what to use it for. This brush is very soft. But the softness and the long bristles together make it unable to hold its designed shape. Especially if you live in a room with heater on at this time of the year, the bristles "blasts" into a broom. Of course it is not for a very densely packed product. But even if for a medium pigmented product, it picks up no color. Also because it loses its shape, application can't be precise. I even have a brush protector for it. But when it's released from the protector, it loses its shape right away. BTW, the bristle blasts when I just left it there intact before I washed it. I have some other WG brushes and I like them, but this one is a big disappointment. 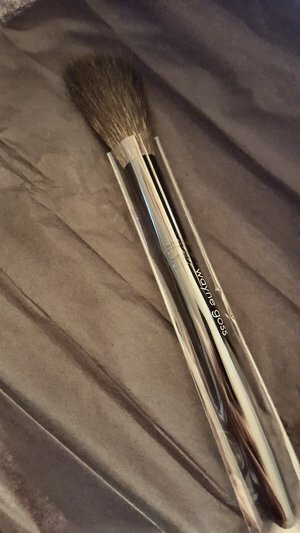 I love the Wayne Goss brushes and kick myself still for missing out on The Artist Brush from last year. When I saw this one, I thought it looked too sparse to be effective but bought it anyway because I didn't want to miss anything. It is incredibly soft and diffuses even the craziest highlighter to a perfectly wearable finish on my skin which has fine lines and some texture. I just got it in the mail today and am already considering purchasing a back up. I'm not going to lie, when I first received this brush I was skeptical. It felt like the bristles were not stiff enough to apply product. The reason I purchased the holiday brush is because in Wayne Goss's video, he stated that this brush was for people who don't want a SUPER BLINDING highlight but more of a "lit from within" look. That's me. Whenever I use other brushes, I often have to use my fingers to blend and diffuse the color after application. I have purchased super blinding highlights that I try my hardest to use a light hand with but still get that ultra beaming shine. This brush solves that problem. I never have to re-blend my highlight after i apply. I've even tried it with the most pigmented of highlights and the application is just perfect. It manages to deposit just the right amount that I need so that I look radiant and natural...well as natural as you can look with a unnatural product like highlighters. Lol. The hairs on this brush are EXTREMELY soft. I didn't even know brushes could feel this soft before. People this is for: Those who like highlight but don't want to shine from space. Those who have a problem being heavy handed. No matter how much pressure you put on the brush, the design prevents from over application. Supposedly this also applies with bronzer and blush (I cannot vouch for this as I have not tried it) but the same thing applies with those products. i truly believe this will help those who are heavy handed achieve a softer look. People this is not for: Those who want an instagram type of highlighted look. As always I'm never disappointed by Wayne Goss and his brushes. It's the only thing I collect all of even if I have no interest. At first I was very unsure if I would like this brush but now that I've used it I'm ordering a back up. It's just as soft as he describes it. Applies powder blush highlight or even bronzer beautifully! I would say if you love it natural this is a must as it makes it super easy and mistake proof. My favorite way to use it thus far is with loose powder as it leaves behind just the perfect amount! I'm in love! Amazing Quality n Attention to Details, featuring the Softest Blue Squirrel n Sculpted Black Lacquer Handle .. Kudos to Beautylish for such Cool Presentation n Packaging and prompt shipping! As someone who truly loves and owns many of Wayne's brushes-I like to say that it's a #fallinlove effect. Try one, and you'll fall in love! 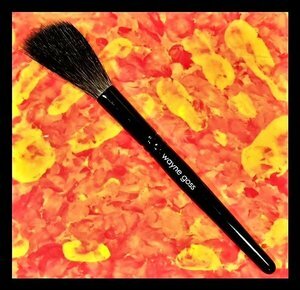 You will fall in love with this brush whether you are new to Wayne's brushes or a lifetime collector and fan like I am. All of Wayne's brushes are cashmere soft, with mind blowing artistry, craftsmanship and innovation. They make makeup application effortless and a pleasure, so you can focus on enjoying the artistry and creativity. I like to say that you have a piece of Wayne's beautiful artistry at your fingertips. Made by the finest artisans in Japan, Wayne curates the entire process and it really is a true labor of love. Now, I felt that preface was important because the Holiday Brush, in my mind, is the culmination of the years of his artistry, his love and respect for the traditional artistic brush making process, and the combination of this artistry with beautiful innovation. The Holiday Brush represents the love of this artistry with innovation at the highest level-the next generation! It is THE softest brush in Wayne's collection so far(which I explained, is unprecedented, as his brushes are exquisitely soft and feel so lovely on the face) the bristles have a VERY special tall yet beautifully wispy nature-and the angle of the bristles(again the innovation) is so fine-and it is made for the contours of the face. What makes Wayne's brushes special is that they pick up and lay down the perfect amount of product(or re: powder brushes, pigment) never disturbing product underneath. 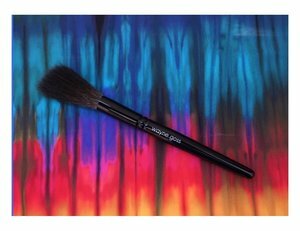 This brush takes this to a whole new level-the way it fans out beautifully and allows the finest and most perfect diffusing of the pigments in the products you are using; just splendid. This is perfect because it allows you to achieve a lit-from-within, sophisticated, luxe look with any highlighter, luminous blush or similar powder product-making your skin look flawless and never overdone! With blending(the most effortless blending you'll find with a brush! ), the brush fans/splays out exactly in the right areas across your face-making it especially perfect for bronzers as well as highlighters. If you are fair-skinned as I am, when you use a bronzer you want to be able to achieve soft dimension but not overwhelm, and this brush does that so well is just so masterful! Perfect to use with products like By Terry Preciosity Flash Light Dual Compact, Charlotte Tilbury Blushes, Kevyn Aucoin's Neo Bronzer and much more! Do not miss this treasure!